Recorded live at the 2008 Santa Fe Chamber Music Festival. "When I listen to these recordings...I am utterly lost to the music. What more can one ask for in a performance?" "I have heard countless recordings of these works, but none in my experience compares to these." "Both as performance and recording, this is an unceasingly beautiful set of the late Beethoven quartets. 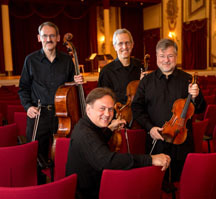 The Orion Quartet has been in business since 1987, and the group's performances bespeak years of getting to know this music—and getting it right." "The players' technique is masterful singly and as an ensemble. Their tone is warm, variable, and beautiful. On these records, the texture is clear and transparent, even in the notoriously intractable Great Fugue..."
"If musicality and spirituality are fair measures, this 2008 set of Beethoven's late string quartets by the Orion Quartet is a complete success." "The Orion turned in a full-blooded account of Beethoven's String Quartet, Op. 59 No. 3, that was, in a word, stunning." "Beethoven's Op. 59, No. 3 balanced patient beauty with fierce energy, spot-on accuracy, rich tonal blend and interpretive felicity." "Saturday, the Orion shone...Syncopations jumped out at you, and dynamics were handled crisply and neatly. The musicians play with tremendous vigor, too, digging into the music...I can hardly remember a better-crafted performance." "These are altogether fine performances, with unabashed use of portamento for expressive warmth, and the music's essential character unfailingly conveyed...the music-making itself is richly rewarding, and can stand comparison with the best." "The Orion plays Beethoven with a very appealing unforced beauty. Their playing is sensitive and expressive, but tempos are not pushed; nor do they try to extract every last possible ounce of drama from the pieces." "This new version of Beethoven's groundbreaking middle quartets is full of the kind of seasoned wisdom you'd associate with quartets from Central Europe half a century ago...the careful attention to delicate changes of dynamics and intricate but never fussy phrasing really opens up these famous pieces in fresh ways." "The recordings are rich in sonority, yet truthful and well balanced, and do full justice to these players' refined searching, and powerfully persuasive readings." "This recording captures the players at their technical and communicative peak. They bring so much assurance, authority, freedom, and expressive depth to the music that they seem to have become entirely one with it. All their strengths are on full display: their sovereign instrumental command; their beautiful, warm, variable tone, homogeneous but individually distinctive; their impeccable balance and rapport. Particularly striking is their control of voicing: within a luminous texture, lines stand out and recede naturally and unobtrusively, connecting seamlessly in sound and expression."